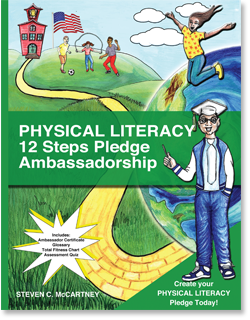 Physical Literacy 12 Steps Pledge Ambassadorship is the passport that connects a path (the yellow brick road to health and fitness) for readers young and old: Or fit and unfit with 12 proven strategies according to scientific based research and national health and fitness objectives to learn how to workout smarter, stay healthier, reduce health disparities and build a healthier community globally. The rhythmic and metaphor of dance provides the vehicle in which the reader becomes engaged in the environment in which we live. Reading this educational and instructional tool can provide new understanding for young teen readers and adults by introducing 12 various topics on total health and fitness for personal best. This book includes Ambassador Certificate, Glossary, Total Fitness Chart, and Assessment Quiz.